I admit I am already pretty checked out as far as term 2 goes. This is the last week before our (downsized) school break, and since I got all my ducks in a row with turning in my common exam yesterday afternoon, I have been coasting. Hell, with Amanda rolling in tomorrow morning, I figure I’m only going to school for a couple periods in the morning, and that’ll be that. The students and I seem to be of the same mind about this. True, we had 2 weeks off at the end of July for Swine Flu, but those weeks were unannounced, so I was mentally unprepared. Also, they only served to make things more stressful with the major projects and common exams the year 12s and 13s had to complete. But now things are done. Tests were taken, graded, and sent to Fiji. My exam for the end of 3rd term has been submitted for moderation. Done and done. 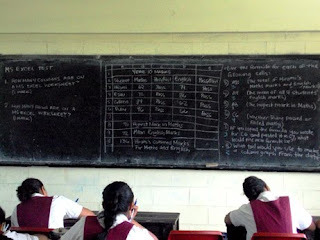 The school year in Samoa is setup so the entire curriculum is introduced in the first 2 terms, and then the 3rd term is completely review (Here “review” is referred to as “revisions”. I’m pretty sure it’s a Kiwi thing.). And I’m just about done introducing new material. This is actually more frightening than anything else because what am I going to do for the next 7 or 8 (?) weeks of classes? “Not to worry,” say my year 11s. At least that seemed to be their resounding cheer reading their Microsoft Excel exams I gave them yesterday and today. Many of them copied the questions from the chalkboard and didn’t bother filling in answers or doing any work. I’m not sure if this was due to problems with motivation or problems with comprehension. I’m hoping for the former, but bracing for the latter. I think I’d be more disheartened if I wasn’t gearing up for a week off. And it seems like the students are right there with me. They’re as checked out as I am. It was as though they were doing me a favor by going through the motions of copying down my test questions. One girl even put her head down on her desk to take a nap, and when I told her to wake up, she said, “I’m finished.” She wasn’t finished at all. But she was. Done and done. Hopefully when we get back on the 14th (instead of the 21st… Boo. ), we’ll be psyched for Microsoft Office Boot Camp. I guess time will tell. I hope you’re keeping motivated. Pictures below. 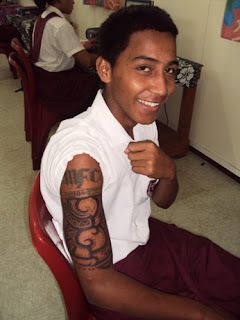 Solinuu requested I take a picture of his new tattoo. I'm still not quite convinced it's real. Girls at a mobile snack bar in front of the Government Building. 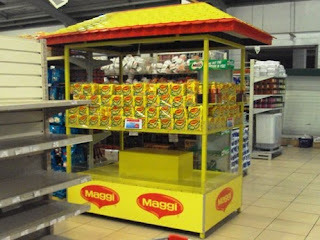 New Maggi stand in Farmer Joe. 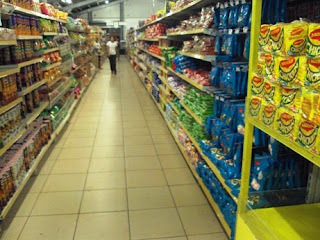 New AISLE at Farmer Joe. Crazy.